Kandhamal, Orissa: The Kandhas are the kings of this land. They are the original tribe to inhabit this sprawl of jungles, mountains and lakes, making up a bit more than half the population. But the modern symbols of power—land, jobs, education—lie with the Panos. The Panos, a mix of scheduled caste (SC) Hindus and Christian converts, have transformed themselves from landless exiles into business leaders, all the while remaining dutiful subjects, says Nihar Ranjan Kanhar, a tribal welfare officer who is a Kandha himself. The strategy rests on their access to education, reservations, and alleged wily ways. “You are my king," a Pano might address a Kandha, according to Nihar, who explains tribal relations anecdotally. “I need some help. Whom else can I go to?" Plied with the local brew mohuli, the Kandhas turn generous and ask what is needed. The answer is usually land and, before the day ends, it might have been given away. The ongoing shift and redefinition of power plays an important role in this state that has been rocked by religious violence in recent months. After assailants murdered Hindu leader Swami Lakshmananda in his ashram on 23 August, Hindu mobs to descend on homes and churches of Pano Christians. Thirteen-year-old Jina Diggal remembers her father waking her up in the middle of the night. In the distance, 300-400 Hindus approached her village. She, her family and the neighbours fled to the forests. “We kept stumbling on the stones in the dark. But our parents told us not to cry and make any noise. They said those men will kill us." By morning, the Kottiduri village was a smouldering pile. Overall, violence has left at least 35 dead. And there is no sign of it relenting. The question of why the conflict has not ended forces a look at its origins, looking back to not just August but 200 years ago, when the Panos first arrived. In Kandhamal, where 80% of the population lives below the poverty line, land and government jobs are the only sources of income. Thus, this fight has become one for survival between tribals and SCs, two of India’s most deprived groups. The Kandhas, uneducated and guileless, still live as they always have—cultivating land, drinking mohuli and building private harems. “So when opportunity comes to better their lot, they grab it," said Bramha Behera, president of the Pano Samaj, a welfare organization in Phulbani. Unlike the Kandhas, they have seized opportunity to better their lives: jockeying for government jobs, educating their children, becoming middlemen to sell marked-up Kandha produce, even converting to Christianity for benefits doled out by the missionaries. In the process, they have overtaken their rulers. The differences are stark: Today the Panos of Kandhamal visibly have better homes, wear better clothes and lobby together. True to character, the Kandhas did not notice. Until they had no choice. In July 2007, the Orissa high court passed an order recognizing all speakers of the Kui language as tribals. Although it is the language of the tribal Kandhas in this district, even the Panos speak Kui. Once enforced, this order allows all Panos who speak Kui to become tribals, claiming jobs and lands currently reserved for the Kandhas. And so, the order triggered a battle over just who is more downtrodden. “They took our land first. Then they took things from Christian missionaries. Now they want to become tribals and want to take away our jobs as well?" asks Lambodhar Kanhar, a feisty Kandha leader who plans to run for election. His question is complex, reflecting discrepancies over the application of quotas. When SC Panos convert to Christianity, they lose benefits such as job reservations because those rights are guaranteed to lower caste Hindus who faced historic discrimination by the higher castes, says Ashok Sahu, a former Indian Police Service officer who now runs a Bhubaneswar-based organization, the Hindu Jagran Samukhya. “But if a tribal converts to Christianity, his constitutional protection...job and land reservation, remain intact. That is why the scheduled caste Panos who have become Christians and lost reservation rights want to become tribals. They want to have the best of both worlds and they thought the uneducated Kandhas would never understand." A court order that recognizes Panos as tribals will certainly end that community’s dilemma that forces them to choose between missionary largesse and government reservations. And in the economically depressed pie of Orissa—and the minds of locals—Pano gains mean Kandha losses. Siba Sankar Sahani, a Hindu Pano who is a member of the Pano Samaj organization, says that the actions of some have given everyone a bad name. “See, Panos are more chalak (wily) than the Kandhas. But not all Panos. We are not trying to take away anything from the Kandhas. We have also lived here for 200 years. We also have our rights....outsiders are to blame. They come here and use both communities as weapons for votes." Certainly, caste and religious politics are at play and even Christian Panos agree with the assessment. “Outsiders have come to this district and their business has flourished. Now they have political aspirations, so they are inciting Kandhas against the Panos," said Nalinkant Nayak, a Christian Pano with Love India, a secular not-for-profit organization in Kandhamal. “We have always lived peacefully." Yet, the July 2007 court order was a watershed that demolished trust between both communities. Lambodhar says of Panos: “They will take away everything they can. We had to now stop them." In 1991, there were 70,000 Christians in Kandhamal. By 2001, the number had exploded 66% to 117,950. Under the Orissa Freedom of Religion Act, all conversions have to be reported to the district magistrate and collector. “Once the collector makes sure that the conversion is not being done under any pressure, the person is free to convert," says Krishnan Kumar, the collector of Kandhamal. But this is almost never actually practised. When the number of Christians grew by almost 47,950, “only two were done with the mandatory approval of the collector", Kumar said. One reason conversions are not reported is because to do so means Panos would lose scheduled caste status—and lose their allotment of reservations in government jobs. “Panos convert to Christianity without telling the government to get benefits from missionaries. Then they use their SC certificate to get government jobs as well..." says sub-collector Pradipta Kumar. B. Kanhar, an illiterate Kandha farmer who grows turmeric on his land near Phulbani, says what the collector cannot: “Every Pano who works in the government with a scheduled caste certificate makes you think: Is he a Christian?" Some government officials say that the Kandhas, who make up 52% of the population, own less than 10% of the district land. Others contest the figure and say it is as high as 60%, but the exact data was unavailable. Here, law allows “a tribal to sell land only to another tribal. Not even to another SC. 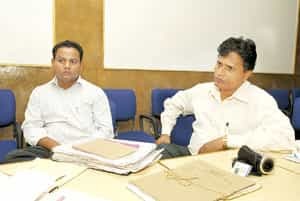 Earlier the law allowed sale of land from a tribal to a non-tribal in special circumstances, but now...there is a complete ban on such sale," says collector Kumar. Some Panos have found loopholes to buy land from Kandhas. Sub-collector, Pradipta—who is investigating land record fraud—gave an example how this is done: A Pano convinces a Kandha to sell land. Both come to the land registrar’s office to record the sale and get a sale deed. The Pano enters his caste as “Kandha" in the paper. Since the registrar’s job is only to collect the stamp duty for the sale, he has no reason to doubt or investigate such a claim. “Once the sale deed is completed, the Pano owns land in the state and state land records reflect his caste as a Kandha," says Kumar. “Then, this Pano goes to the tehsildar and says ‘I am a Kandha. Look, I own land here and the sale deed has noted me as a Kandha.’"
The tehsildar gives the Pano a tribal certificate. And thus, the SC Pano becomes a scheduled tribe Kandha. He is now free to convert to Christianity without losing reservation rights to land and government jobs. “The amity that once existed between these two communities has gone," says Bhagaban Mohanty, a lawyer and Bharatiya Janata Party worker in Kandhamal. For their part, Panos say they were making an honest living and that nothing can excuse what they have endured. In a relief camp at Tikkabli, Diggal has found new friends, but says she would like to go back home. Her family hesitates. They tell her: “Those people might come again." Next: The emerging Maoist threat in Kandhamal.